If you’re up for a wander around Fremantle’s High Street this July, then I highly recommend checking out the Hidden Treasures music festival. The month long series takes place every Thursday night, and in my opinion it’s the best event taking place throughout the winter in town. 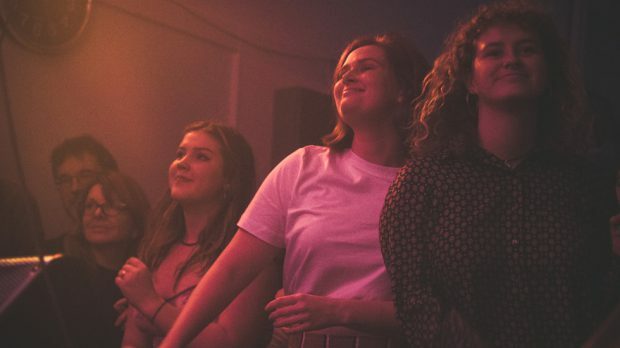 $20 gets you access to venues along High Street that aren’t always accessible to the public, and the festival is a chance to check out local music– the familiar and the weird–in uniquely historical places. I do wish I was more prepared on week 1. The schedule is a bit of a nightmare to follow, and I agonised over which acts to miss. But darting around town on a cold winter night is part of the fun, and I love seeing hoards of people migrating through the streets from venue to venue. I kicked off the evening upstairs at the National Hotel with Emlyn Johnson. This isn’t my favourite venue on the Hidden Treasures circuit–the room is quite hollow, and the sound just bounces around the cavernous ceiling above, but I wanted to see what style of Emlyn the crowd was going to get. Sometimes he’s picking away at a guitar or banjo, and other times he’s playing a backing track and moving around the room like a bush chook scratching at the dirt. We got bush chook Emlyn that night and I couldn’t be happier. Emlyn’s deep, guttural vocals filled the room while he flailed around the stage, taking quick breaks to sip from a big frothy pint of Guinness. My favourite tracks from his album Contested Mark made it into Emlyn’s set: the repetitive and catchy Rubbish; the scolding cultural commentary of Surplus; the swaying groove of Slippin + Slidin. I love how Emlyn is transported into his own world when he performs. The audience does not matter to him. I scanned the room and could see a lot of puzzled faces; folks who have certainly never seen an act like Emlyn trying to make sense of the performance. You can’t make sense of Emlyn. You just have to go along with his energy. It’s worth it. From The National I race over to the Fremantle Buffalo Club (my favourite venue at the festival) to catch Bass Lemon’s set. The dusty Buffalo Club always packs in, so after grabbing a middy I snaked my way to the back of the room to find a chair and listen. The group is certainly drawing heavily from funk and soul acts, and their sound makes no attempt to hide those influences. A cover of Stevie Wonder’s Superstition riles the crowd up with something familiar. The group then pulls out an interpretation of Amy Winehouse’s own cover of Valerie. I like when acts re-interpret songs for cover versions, but a track like Valerie doesn’t need to be overly meddled with. There’s no harm in smashing out a carbon copy cover of a song that’s guaranteed to keep the crowd’s momentum humming. My fingers were crossed. I was hoping vocalist Ellen-Mai would belt out the tune in Winehouse’s surly style, but she instead opted to croon an eased down version. It’s proper but subdued. If you’re going to cover Valerie, you really need to blow the lid off of the place. I think Bass Lemon can do it, and I’d love to see them try. I sink my middy and march over to the Wyola Club. I have to say, the Wyola is a venue to watch. The troubled former R.S.L. Club is alive again, and attracted the bulk of a youthful, urban crowd. Ben Foss from Eat No Evil has set up shop at the back of the large, sparse room to feed the raucous crowd his spunky tacos throughout the festival. The Beer Farm crew was on hand to pour cold pints of beer. I perched myself by the buffet salsa station at the back of the room to take in hip-hop trio Girlfriend Material, but admittedly got distracted by the crowd and the venue around me. 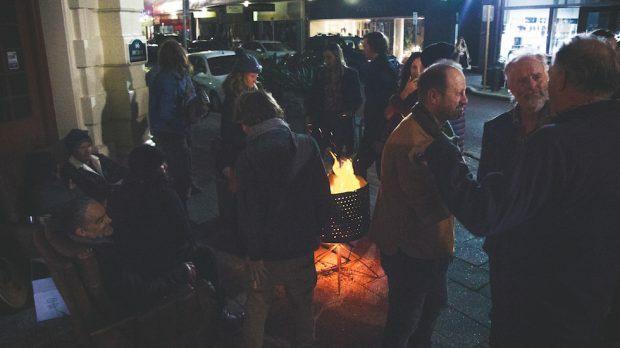 The Wyola certainly has potential to show off Fremantle’s growth, and is perfectly suited to become a hideaway venue. Word has it that upstairs at the Wyola lays a massive hall room with large windows streaming in sunshine from High Street. Heaps of potential if the space is curated well. My mate Jarrah graciously buys me a pint at the Wyola. I sink it and then jog over to PS Art Space (PSAS) to catch the end of Hyclass but turn up when the PS DJs are guiding the crowd. Big space. Really big space. The DJs help add some atmosphere to the murmured chatter in the room. PSAS is a good place to halt the brakes and mingle under the latest quirky modern art exhibition that’s showing. It was nice to find a table and review my notes. It was also nice to hydrate. I didn’t want to miss HEEBIEJEEBIES so I speed walk back up to the National Hotel to catch their set. I’m surprised The National is showcasing more experimental, oddball acts than the usual folk-country-rock performers. I’m ok with that choice. A band like HEEBIEJEEBIES can really cushion the room and stop the sound from bouncing around. The duo’s recipe for songs drenched in synths and drones is evil and deadly and I dig it. Based on the chatter in the crowds moving up and down High Street, it seemed that most people would be ending their night at the Wyola to see Last Quokka rage on stage. Back I go. The RTRFM stalwarts blaze through their punk numbers, and works the audience into a frenzy. There’s a bit of crowd surfing and a bit of moshing. The scene changes so quickly from group to group at this venue, and it looks like the Wyola is setup to manage those differences. Last Quokka closes out the night, and I’m done, too. Hidden Treasures can be quite a mad dash. 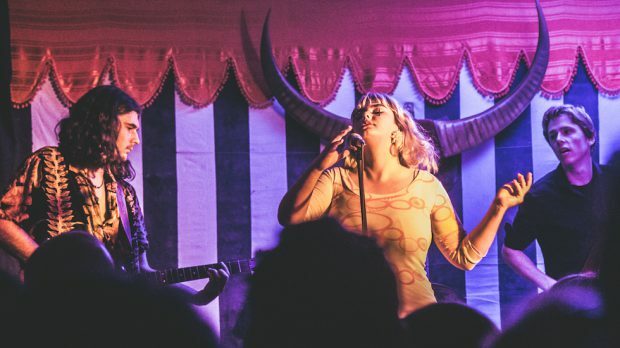 The great part though is if you miss a gig or venue you really wanted to enjoy, there’s always the week after to try it all out with a completely new set of intriguing local talent.